Ask fellow campers about "Bob Scott Campground" and nearby attractions. Few sites are level, but are manageable. Very close to Hwy US 50, can be a little noisy during the day, but quiet at night ("Loneliest Hwy in the world"). Two vault toilets, some sites have shade from dense pinion forest. Has excellent access to off-Hwy 4x4 roads, adventure etc. It's a favorite stopover for our north/south journeys. We camped at Bob Scott Campground in a Travel Trailer. Forest Service campground. Our 37' motorhome would fit in only one space ( the first one as you drive in). Both times we have been here the campground was filled by mid-afternoon by travelers staying only one night. Near highway, but we could not hear any traffic. Would stay here again. We camped at Bob Scott Campground in a Motorhome. No hookups but drinking water available. Good ATT service. Very hard to find a site that you could get level. We got there early enough that we had no problem. Extremely quiet and peaceful. We would stay here again. We camped at Bob Scott Campground in a Travel Trailer. Decent FS camp right on US50 about 5 miles E of Austin NV. Open seasonally, has water taps and flush toilets but no dump station. $10 to camp, some pull thru sites but none are level. Did see one 5th wheel but it was parked at an angle. 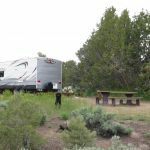 There are plenty of boondocking sites nearby including Hickison Petroglyphs and a hot spring, both free but no water at either. We camped at Bob Scott Campground in a Travel Trailer. Great overnight stop on US 50 just outside of Austin, NV. Great place for a one nighter along highway 50. Nothing fancy but off the road enough that the low trees provide some protection from road noise as well as some privacy. We camped at Bob Scott Campground in a Motorhome. No one was here when we arrived mid afternoon for a one night stay. It gave us time to find the right spot for our 40 foot RV. Not many of the sites are good for a rig this big, but #9 worked well for us. We didn't use the restrooms or build a fire, but enjoyed watching the falling snow. The park remained very quiet with only one other vehicle spending the night. A good stop for a night crossing Nevada on US Highway 50. Only a few shops were open in Austin but you can get dinner and treasures by visiting the stores that were open. We would stay here again. We camped at Bob Scott Campground in a Motorhome. This is a great little stopover about 7 miles east of Austin, or even as a destination visit if you want simple R & R, peace and quiet (despite being right off Highway 50, a very lightly used road). Shade, water spigots, flush toilets (but only in summer, I think, then only a vault is open), picnic tables, and fire rings. Sites are paved or gravel. Caution: there are coyotes right in/very near the camp so if you have small pets, keep them safely inside or with you. We camped at Bob Scott Campground in a Motorhome. As noted, there are 10 sites in this Forest Service campground, which is just off of Highway 50 east of Austin, NV. We are only 27 foot and a motorhome, and there were only three sites that we could have gotten into and leveled. We were fortunate in that we had a nice pull-through site and leveling was easy. The campground can be a bit hard to find, it is just east of Bob Scott summit, which is just east of Austin summit. There is a sign on 50 to note the campground. The GPS coordinates are 39.456378, -116.994735. When we were there at the last of May, the water faucets were not turned on, so take enough water with you. There is no dump, so plan on hauling out everything you haul in. There were trash cans. We did not use any of the restroom facilities, so cannot comment on them. From our site, we had wonderful views looking out across to the mountains. We had no road noise at night, Hwy 50 is not a very busy road. It is self-registration and only $10. Please do pay so that we can keep this nice campground available. I paid the full 10, even though I would have qualified for the $5 senior. We camped at Bob Scott Campground in a Motorhome. Great place to spend a few days. Sites tight and not level but we managed to get our 36' in site #9. Pull thru at top was already taken. Close to highway but not much traffic. All good except restroom which was really awful. There's a vault toilet that's much better. Hiking is nice on dirt roads as long as you don't mind running into grazing cows. Really enjoyed our stay here. Watch carefully for the entrance sign or you'll miss it! We camped at Bob Scott Campground in a Motorhome. Like another reviewer, we bypassed the questionable looking spots in Austin in favor of the higher altitude location of this CG. Nothing frilly; it's bare bones, one step away from boon docking. Water spigots scattered around, cement picnic table, fire ring. Rest rooms were a bit scary & 1 was simply closed off. Pavement/gravel rd & site - nearly level. We probably would stay again. We camped at Bob Scott Campground in a Motorhome. We hit Austin in the late afternoon and looked for a place for the night. The two in town didn't look too inviting so we checked websites and found this park, just 4.5 miles East of town on Hwy 50. Small park, some pull-throughs, some back-ins but super quiet, a really nice little place to stay. There is water at several spigots, rest rooms with flush toilets but no frills. Just a nice, quiet place to stay for a day or more. I think it's either BLM or Forest Service and that includes 50% discount for Golden Age pass ($5). We camped at Bob Scott Campground in a Motorhome. Are you affiliated with Bob Scott Campground ?